No matter your political persuasion, most would agree that the 2016 Presidential campaign will not be remembered for its civility. The Spirited Table®, on the other hand, makes every effort to be a model of hospitality, grace and decorum. The great food, the lovely décor, the exquisite fashion, and the pleasant exchange of ideas mark the Spirited Table® as a place where we can “agree to disagree” without being hostile or rude. Name-calling, crude epithets, and general belligerence streams from campaign rallies on the daily news. In response to the lowering of discourse, I encourage us all to look back to a great leader who did none of the above. On this day, which would have been his 88th birthday, let’s pause to remember the life and stylish legacy of a man who represented all that America should be, and all that the Spirited Table® strives to be. That man is Fred Rogers. His stylish legacy is the Cardigan Sweater. 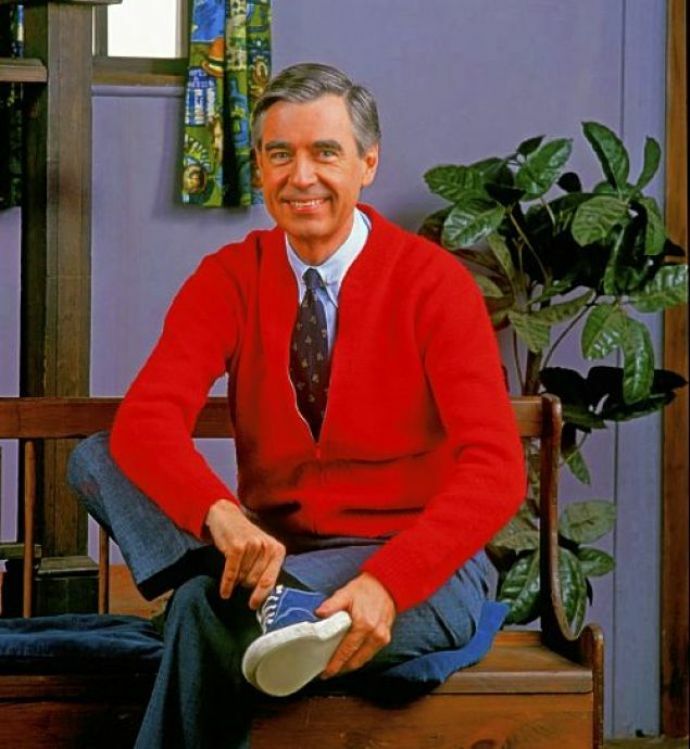 Surely, I won’t be alone on this day, commemorating the life of the iconic Mr. Rogers. For over three decades, via his Neighborhood, he modeled and instructed children in the ways of respect, honor, compassion, decency, and love. The hallmark of his program was his entrance to his “home”. His daily wardrobe change, from business suit and dress shoes to cardigan sweater and sneakers, marked a transition from a busy day’s work to a relaxing evening of conversation with good friends. Kinda reminds me of The Spirited Table®. There are many things for which we can remember Mr. Fred McFeeley (real middle name) Rogers. The factor for which this post pays tribute is his warm, inviting, unguarded, utilitarian, and eminently comfortable cardigan sweater. Methinks a change of wardrobe might bring about a change of heart. Just as a black tie event signifies certain formal and fancy expectations, if more of us slipped on a cardigan sweater, we may project an inviting, calm pose. And since cardigans have mainly been the accoutrement of choice for the over-60 set, they are very affordable. For all you hipsters out there, most thrift stores sell vintage button-up sweaters for less than $25. Here’s an authentic, albeit higher priced ($35) beauty selling on EBay. As you prepare for your week and you consider all that lies ahead, give a thought to how we can rebuild our nation’s spirit of generosity and brotherly kindness. Honor Mr. Rogers. Be a neighbor. Buy a cardigan. Make America Warm Again.